Spanish Talmudic authority; born at Valencia in 1326; died at Algiers in 1408. He settled early in life at Barcelona, where he studied under Perez ha-Kohen, under Ḥasdai ben Judah, and especially under R. Nissim ben Reuben (RaN), for whom he professed throughout his life the greatest veneration. Although Isaac acquired while still young a world-wide reputation as a Talmudic authority, and halakic inquiries were addressed to him from all quarters, he led a private life, earning his livelihood in commerce until he was about fifty years old, when he was compelled to accept a position as rabbi. Together with six other prominent men of Barcelona, among whom was his younger brother Judah ben Sheshet and his teacher Nissim ben Reuben, he was thrown into prison on a false accusation. After his acquittal he accepted the rabbinate of Saragossa; but troubles still awaited him. To the grief caused by the death of his brother Judah and of his son-in-law was added that due to dissensions in the community, stirred up by the dayyan Joseph ben David. 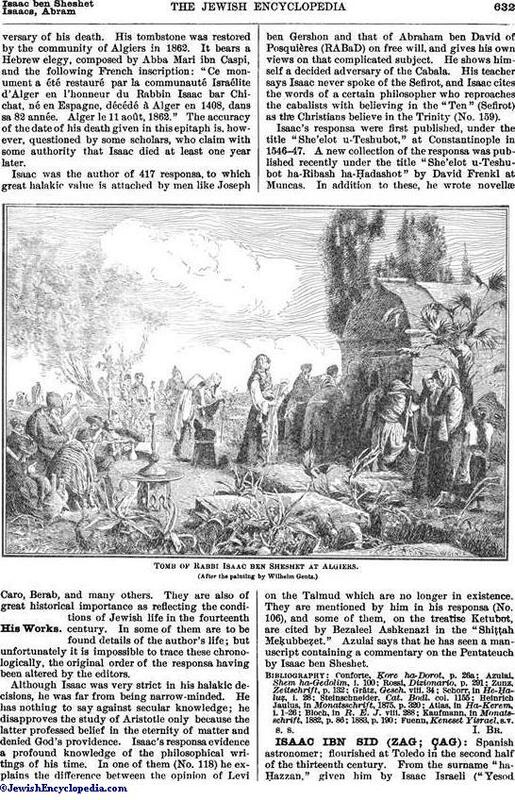 Isaac in consequence accepted the less important rabbinate of Calatayud; but when he was on the point of leaving Saragossa the leaders of that community induced him to stay. The peace, however, did not remain long undisturbed, and Isaac settled at Valencia, where he directed a Talmudical school. In 1391 occurred the great persecutions of the Jews of Spain in consequence of the preaching of Fernandes Martinez. Isaac saved himself by flight. After sojourning a certain time at Milianah he settled at Algiers, where he was received with great honor. Fate, however, had decided that he should not find peace. A certain Spanish refugee who had settled at Algiers before him aspired to become the leader of the community, and, seeing in Isaac a rival, began to persecute him. To give to Isaac the power necessary to act against this man, Saul ha-Kohen Astrue persuaded the government to appoint Isaac rabbi of Algiers. But this won for him a still more powerful enemy in the person of Simon ben Ẓemaḥ Duran, who disapproved of any intervention on the part of the government in the affairs of the rabbinate. 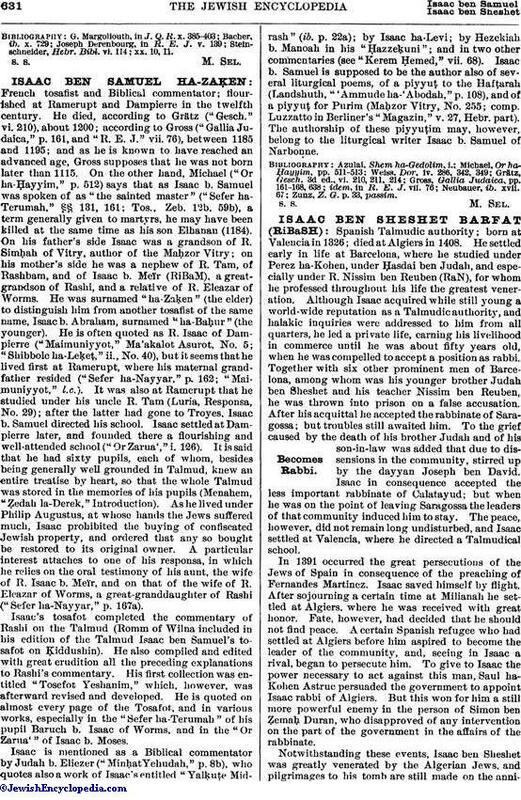 Notwithstanding these events, Isaac ben Sheshet was greatly venerated by the Algerian Jews, and pilgrimages to his tomb are still made on the anniversaryof his death. His tombstone was restored by the community of Algiers in 1862. It bears a Hebrew elegy, composed by Abba Mari ibn Caspi, and the following French inscription: "Ce monument a été restauré par la communauté Israélite d'Alger en I'honneur du Rabbin Isaac bar Chichat, né en Espagne, décédé à Alger en 1408, dans sa 82 année. Alger le 11 août, 1862." The accuracy of the date of his death given in this epitaph is, however, questioned by some scholars, who claim with some authority that Isaac died at least one year later. Isaac was the author of 417 responsa, to which great halakie value is attached by men like Joseph Caro, Berab, and many others. 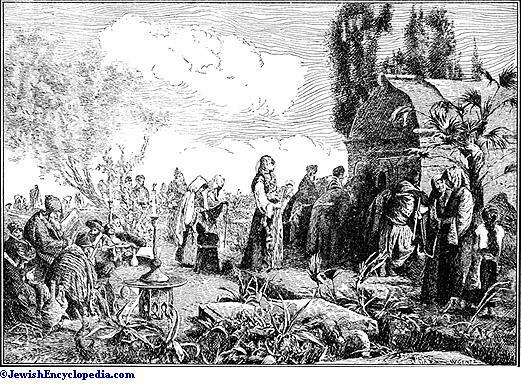 They are also of great historical importance as reflecting the conditions of Jewish life in the fourteenth century. In some of them are to be found details of the author's life; but unfortunately it is impossible to trace these chronologically, the original order of the responsa having been altered by the editors. Although Isaac was very strict in his halakic decisions, he was far from being narrow-minded. He has nothing to say against secular knowledge; he disapproves the study of Aristotle only because the latter professed belief in the eternity of matter and denied God's providence. Isaac's responsa evidence a profound knowledge of the philosophical writings of his time. In one of them (No. 118) He explains the difference between the opinion of Levi ben Gershon and that of Abraham ben David of Posquières (RABaD) on free will, and gives his own views on that complicated subject. He shows himself a decided adversary of the Cabala. His teacher says Isaac never spoke of the Sefirot, and Isaac cites the words of a certain philosopher who reproaches the cabalists with believing in the "Ten" (Sefirot) as the Christians believe in the Trinity (No. 159). Isaac's responsa were first published, under the title "She'elot u-Teshubot," at Constantinople in 1546-47. A new collection of the responsa was published recently under the title "She'elot u-Teshubot ha-Ribash ha-Ḥadashot" by David Frenkl at Muncas. In addition to these, he wrote novellæ on the Talmud which are no longer in existence. They are mentioned by him in his responsa (No. 106), and some of them, on the treatise Ketubot, are cited by Bezaleel Ashkenazi in the "Shiṭṭah Meḳubbeẓet." Azulai says that he has seen a manuscript containing a commentary on the Pentateuch by Isaac ben Sheshet. Tomb of Rabbi Isaac ben Sheshet at Algiers.